In just two weeks the revamped Miami Dolphins stadium will reopen for both NFL and NCAA football. In recent months it’s been known as New Miami Stadium as the operator was searching for a naming rights partner. Dolphins president Tom Garfinkel informed on Thursday that there were around 50 companies involved in talks before eventual partnership was sealed. On that day Dolphins confirmed that Hard Rock is the partner for upcoming 18 years. Naming rights deal for the reconstructed stadium is estimated at $250 million and should help recoup part of the construction costs. Initially thought to be worth $350 million, works are now expected to cost a total of $550 million. With app. $13.9 million per year the contract with Seminole tribe (owners of Hard Rock International brand) is slightly better than average deals for NFL stadia in recent years. 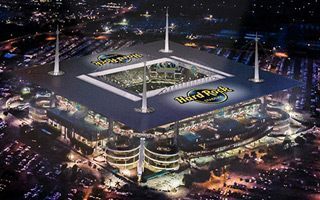 While presenting the new naming rights partner, Dolphins also announced that music concerts will now be a more regular feature of the Hard Rock Stadium. With its impressive canopy of 58,000 m2 it will offer much better conditions than before, which should also matter to soccer fans. Especially that Dolphins have a deal for no less than 6 friendly game of the widely popular Brazilian national team within the next few years.